This is a Flickr badge showing public photos from elliotlevin. Make your own badge here. Wow, this is great. 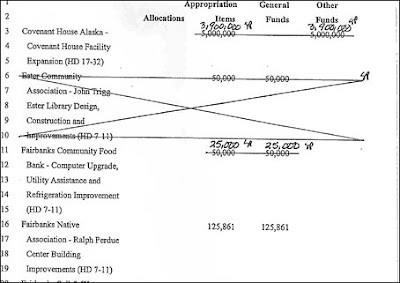 This is Sarah Palin cutting funding for a program that provided housing to teen mothers in Alaska (note her initials, SP by the big cut on the top line). Gotta love Republicans... They got theirs, and that's all they care about. Article at the Washington Post.